This is an exclusive look at my new costume and act ‘Lili Mewleen’, which will be released from it’s burlesque shackles at the War and Peace Show 2012! 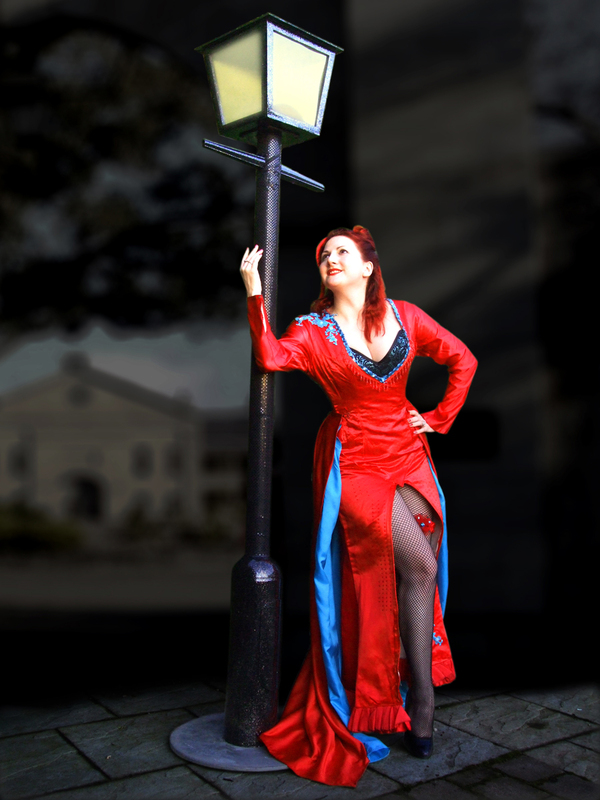 A nod to one of my favourite female icons Marlene Dietrich, this act features a 7 ft lampost made by Mr. Mew and a STUNNING Vollers corset that has a ‘quick release function’. I got to try on this stunner of a corset when I did the interview for The One Show and met the gorgeous Corina and her fabulous group of ladies in the factory. Knowing how much work goes into these British made corsets has given me even more faith in the UK industry! I made the fascinator, garter and bustle. The dress was once a rather black lacy and frilly affair (once owned by a drag queen) of which I stripped down to the basics and started again with electric blue! This fun act will also be staged at Twinwood Festival this year in a brand new entertainment hall, which will also house my swoon-fest Max Raabe! Posted in Events and Performances, Publicity and Media Announcements and tagged burlesque acts, burlesque dancer, kitten von mew, kitty meow, lil marleen, marlene dietrich, pinup girls, twinwood festival, vintage girls, vollers corsets, war and peace show. Bookmark the permalink.